UQ graduates and Wotif.com founders Graeme Wood and Andrew Brice have been recognised for their outstanding contribution to higher education. 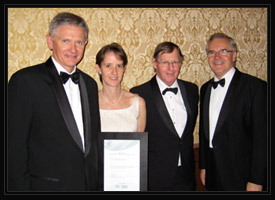 Co-founders of accommodation website Wotif.com, the pair was presented with the Business/Higher Education Round Table Award for Outstanding Philanthropic Support of Higher Education, by the Honourable Julia Gillard, at a ceremony held in Melbourne on November 21. Both men recently gave an $18 million kick-start to The University of Queensland Endowment Fund (UQef). Founded in 2007, UQef is a new avenue for donors to support academic initiatives such as scholarships, named professorial chairs and specific research programs in areas of particular social need. The first philanthropic support to come out of the fund includes 10 scholarships totalling $500,000 for PhD and Honours level research in cultural history, new media studies, peace studies, conflict resolution and social aspects of natural resource management and sustainability. Mr Wood has already specified that part of the fund would be used to establish a research and education centre targeting youth drug and alcohol abuse. UQ Vice–Chancellor Professor Paul Greenfield praised Mr Wood and Mr Brice for their award and contribution to the University. “This award goes to two individuals who have not only excelled in their chosen careers but who continue to nurture and support the careers of many UQ graduates,” Professor Greenfield said. Mr Brice said the award was a real honour and hoped to encourage other entrepreneurs and business owners alike to connect and invest in research and education. “As a graduate of UQ, the University is close to my heart and through the UQeF I am proud to be able to support dedicated students who share a common vision – that is to make significant strides forward in research areas,” Mr Brice said. Mr Wood said it was important to address the root of negative cultural affects on the youth of today and to take on a hands-on approach to supporting and educating them on the dangers of youth substance abuse. Mr Wood, a Bachelor of Economics and Master of Information Systems graduate and Mr Brice, a Bachelor of Commerce founded Wotif.com in 2000. Wotif.com has grown into Australia and New Zealand’s leading accommodation website that attracts 3.4 million visits and 205,000 bookings a month.